It's hard to believe, but February is the 8th month of my Starry Night BOM. With each of these that I do, I can really see improvement in my piecing. I really like the colors on this block too. I'll for sure be making one of the filler blocks with these colors. Switching gears...as you may well know, it has been the snowiest winter in VERY long time around here. 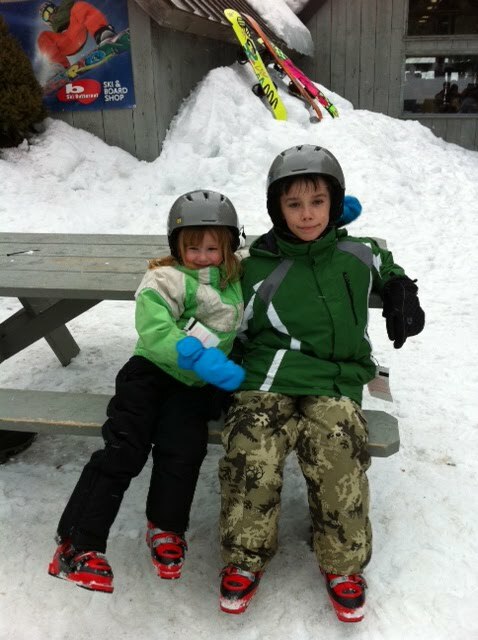 The result is that my sweetie has gotten full on back into skiing and has pulled me along with him. 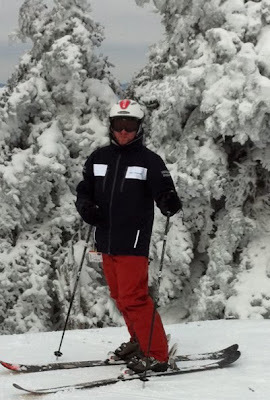 Last weekend we drove up to Stratton Mountain in Vermont on Friday so we could ski for the day Saturday. Here's WBR (that's World's Best Rob) at the top of the mountain...look how low to the ground those trees are and how caked they are with snow! 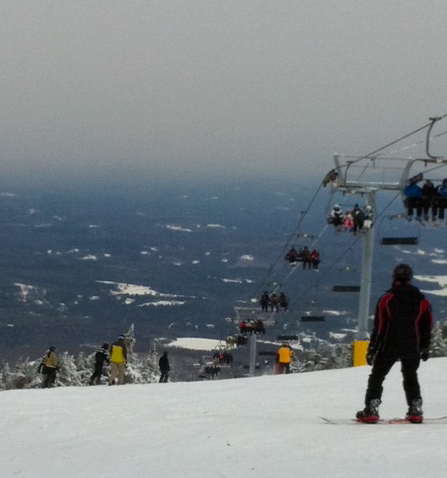 I'd never been to a "big" Vermont mountain, so I really enjoyed the view from the top. It was challenging skiing for me for sure, but there were loads of trails to try, and many lifts, so we got a full day of skiing in. I went down my first "glades" trail (where they don't take out the trees and you have to ski through the woods) and only fell down four times! Just so you all can see what a goober I can be...this is a picture I took of myself (with my new iPhone, my old one got dropped in a bathtub and died the night before). You can see how giddy I am, both to be at the top of the mountain, but also to be enjoying my new toy. We had so much fun on our day away, that when we came home, we decided to take the kids to a smaller local mountain in Massachusetts called Butternut on Sunday to see how THEY liked skiing. These pictures were taken BEFORE any skiing was actually done. Note the happy faces. 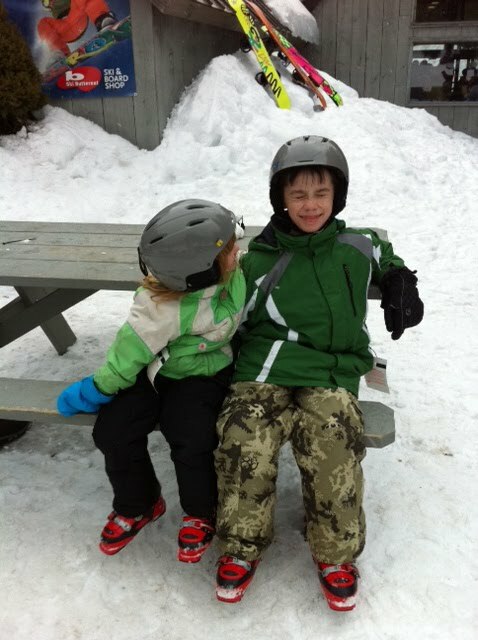 And here's Ally, making sure her big brother is actually smiling for the camera (which he wasn't). For better or worse, they both did ok, but neither of them seems to be clamoring to go back. 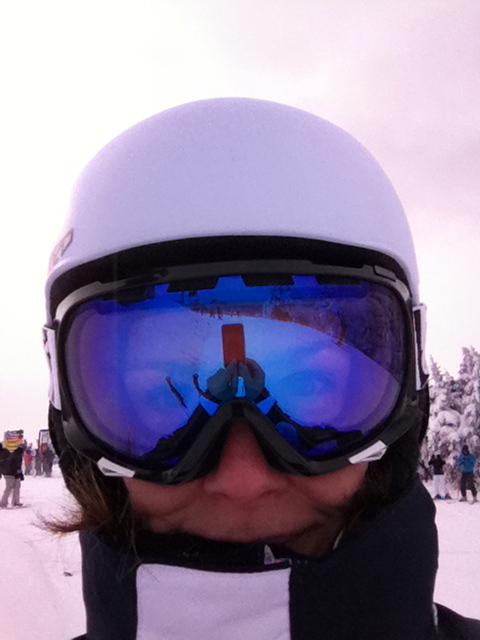 So for now, it looks like skiing will by my thing to do with Rob. Which is ok by me. What do you do with your family outdoors in the winter? I'd love to hear about it. Next up, an update on my argyle quilt for my little (big) man, and my first wonky block!